Ask The Bellwether: How do you weave in the end at the toe? How do you weave in the end at the toe? I close my sock-machine knitted sock toes by kitchenering from the purl side; I knit about 10 rows of waste yarn after the sock is done, and leave that chimney on the outside of the sock (so it's inside when the sock is inside-out). 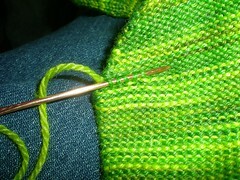 I like the purl-side kitchenering, because you are going back-and-forth across the gap. 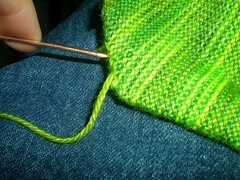 It gives me a chance to see the tension as I pull the yarn up, and "works for me". 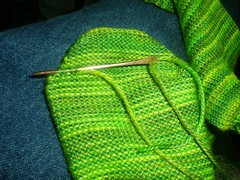 Sure, you can kitchener from the knit side if you want - here's a great picture tutorial on that, by Karen In The Woods. One nice thing about the purl-side kitchenering is that your yarn is ready on the inside to be woven in. I want this to go fast, but not to leave a noticeable bump against my oh-so-delicate toes. So, I take five stitches and weave like a slalom, up through the first one, down through the next, and so on. I pull the yarn up so that it seats itself next to the loops it runs with, and makes loops in the "gutter" between rows where there is no loop. Then, I turn around and go back for five stitches, usually on the row above as shown here, pulling it through the same way (click picture for bigger). Once it's also pulled into place, I can snip close to the last stitch I came through (carefully) and the socks are ready for washing! The yarn in these socks is Superwash Merino/Bamboo, hand dyed by Pat Fly (Angora Valley Fibers). The needle is copper, handmade by Tara Flying Horse; purchased from Crown Mountain Farms at a show; I have several of the same maker's silver needles as well, which I use for Nalbinding. 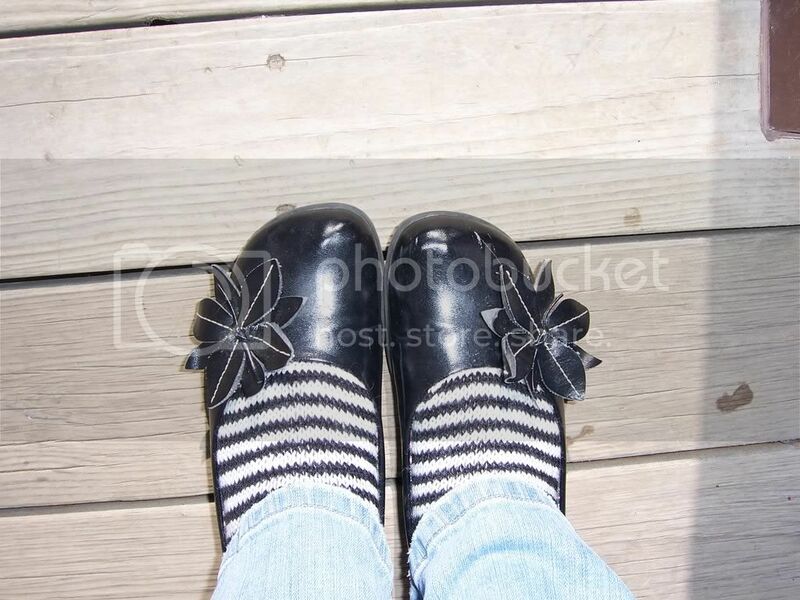 The pattern for the socks was based on Soxophone Player's mock rib hem and stockinette foot, using the no-hole-heel and no-dog-ear toe reviewed in recent posts. If you want a terrific knitting blog about all the details of hand knitting (including, I'm pretty sure, weaving in ends), I heartily recommend Tech Knitting. Packed with tidy graphics and clear techniques! I tagged you for an award on my blog. You only need to respond if you want to. Thanks!